Have you heard about Share Handmade Kindness? No?!? You must be living under a rock, everyone’s talking about it! While I’m contributing both creations, funds, and love, this is my “official” share here on the blog to nudge you into stepping out into new areas of giving. Note: There are ZERO affiliate links used in this post, and no ads will be shown on my video….it’s all for the love of doing the right thing in my own little way. Edited to add: Please consider joining me in making a donation to the French Red Cross for the work they are doing to help in Paris right now. My heart is broken for the people there. There’s no need to report back or to hashtag that you’ve done so…Mt 6:4. Sometimes the most powerful cards can be one layer – so much impact with so few supplies! White ink, some Christmas tree stamps to make a non-holiday design, a fab sentiment, and some kraft card bases……add a few pencils and you’ve got a really intriguing card! Watch the video below or click HERE to watch in HD on YouTube. 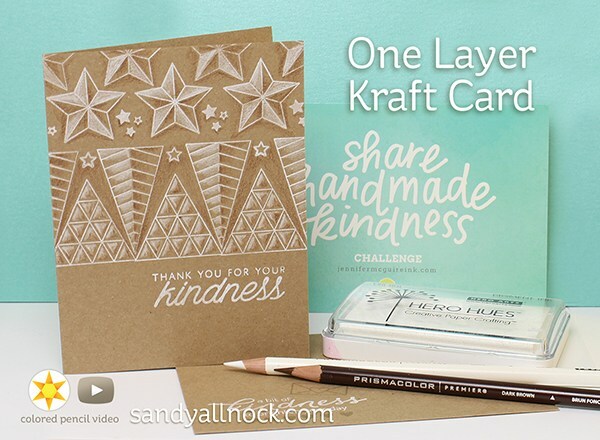 There are so many ways to give – sharing your own handmade creations (cards, baking, sewing, or whatever you make! ), giving funds to your favorite charity, or sharing yourself. That’s the one I find the most life-giving! I’ve given much of my life in service to our deployed heroes through Operation Write Home – and as that is drawing to an end, I’ve been slowly ramping up involvement in other areas. I now get to share my handmade cards with more people – patrons, blog readers and youtube subscribers, as well as friends and family of course. Some days I make special efforts to spend time with friends sharing “handmade” hugs. And I just said yes to a part in my church’s Christmas play, eeep! I’ve always wanted to be part of a play, and getting to share the Gospel too? Yeah! I have plans to step out in other areas in 2016, and I’m excited at the prospect. Great idea to share all the fave charities in the post so the rest of us can join in. Always talented and generous Sandy! Love the geometric feel of this card. This is so awesome. I am a lover of kraft & white and this is such a lovely card. A good friend of mine works at a local seniors residence and we often make cards together. I am thinking of asking all of my card making friends if they will join us in making cards regularly to donate to the seniors home so they can have access to cards to send/give to their loved ones. Free of charge! Thank you Sandy for teaching us techniques as well as humility. I was chosen and am thrilled that my foundation will get more awareness because of you. Sickle Cell Foundation. Thank you. I love the look of white on kraft and colouring on kraft! This does not look like a one-layer card! Gorgeous! And thanks again for all the wonderful donations you made, including to the one I chose! This is one of the best and most rewarding prizes I’ve ever won! Thank you from the bottom of my heart! Love this technique, I’m going to give it a try! Love the look of white on kraft and enjoyed seeing Christmas stamps used to make other cards besides Christmas. Thanks for having such a giving heart. St Judes is my charity of choice. Living with so much cancer in our lives, and seeing a good friends son fight for his life makes me always want to do a little more. Your work is always amazing, and I am going to give it forward by making a special treat and giving it away. Its always nice for Random acts of kindness. Thank you so much for your generous gift to these charities and for giving away your tags!! You truly are one of a kind Sandy!! What a wonderful post, not only for the absolutely gorgeous card, but for the great words of encouragement to give. Thanks so much Sandy for being an inspiration to all! I was so happy to see the Lupus Foundation of America on your list! I worked for this organization for 15 years and it’s truly a worthy cause! Lupus is one of the most misdiagnosed and least understood of the autoimmune diseases with only one lupus drug approved by the FDA. I have 8 friends diagnosed with lupus! Your generosity is awe-inspiring and your donation will help in the fight to battle this disease. Thanks so much for your generosity! Thanks for listing all the places that received your donations. It always fills my heart to see so many people donating. Especially at this time of year, especially at this troubled time in my community, my country, and my world. And, as always, love this card! Thanks for sharing your art. It brings me peace and beauty every time I watch. Beautiful! And thank you for being so generous as to make donations!!! Thank you Sandy for the donation to Second Chance. After the door closed on OWH and Skippy passed I started volunteering there. It fills my heart with joy to help with the dogs. all I can say is Wonderful! So pretty! Thank you for your generous giveaways and donations! Really beautiful card – anyone would love receiving this. Thank you so much for sharing your talent, generosity and love. Having lived in Arlington, Texas most of my life – I have donated to the Mission Arlington, and happy to see they were a winner. Your fabulous card, art, and encouragement are great! Stepping out and acting in small ways is an amazing gift for nonprofits and overlooked government workers. You are a true hero in so many ways. Thank you for sharing your time, talent & KINDNESS. Kraft is my favorite cardstock. Add a white medium & I’m in! You made these trees look like they were embossed with a folder! I’m sure your Mom & any recipients will LOVE these cards. Safe travels & Happy Thanksgiving. What a terrific effect, for such a tiny list of supplies! I know you’ll wow whoever is sitting next to you on the plane as you work on these cards and head to your Mom’s for Thanksgiving – and I know she can hardly wait till you arrive.